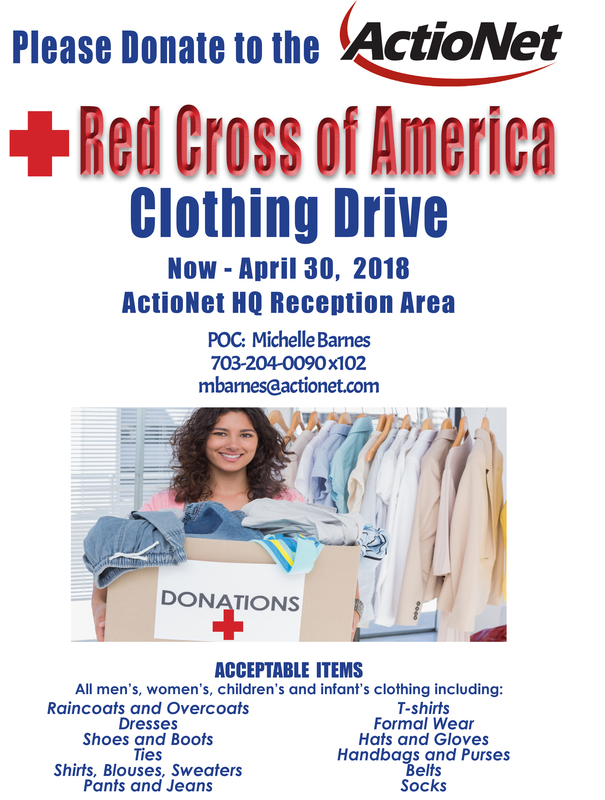 ActioNet will be collecting new and gently used men’s, women’s, children’s and infant’s clothing through April 30, 2018. The kick-off event is set to take place on Friday, February 9, 2018 at 1:00 pm on the 6th floor of the ActioNet Corporate Offices. In addition to the American Red Cross Clothing Drive, ActioNet will be celebrating Heart Health Month, Valentine’s Day, Lunar New Year and February employee birthdays. Please consider Wearing Red for the event. Items can be donated by dropping them off at the ActioNet HQ Reception Area. Acceptable items include: coats, hats, gloves, sweaters, dresses, shirts, blouses, pants, jeans, ties, belts, socks, shoes and boots. The American Red Cross (ARC) is a humanitarian organization that provides emergency assistance, disaster relief and education in the United States. The American Red Cross has been the nation’s premier emergency response organization bringing shelter, food, clothing and comfort to those affected by disasters, large and small. They collect lifesaving donated blood and supply it to patients in need, provide support to our men and women in military bases around the world, and to the families they leave behind. ARC trains communities in CPR, First Aid and other skills that save lives. ARC also assists our neighbors abroad with critical disaster response, preparedness and disease prevention efforts. ARC is able to do all this by the power of volunteers and the generosity of donors. ActioNet, Inc., headquartered in Vienna, Virginia, is an SEI CMMI® Level 3, ISO 20000, ISO 27000, ISO 9000, HDI-certified, woman-owned IT Engineering Services Firm with strong qualifications and expertise in Cloud-based Solutions, Cyber Security and Agile Software Engineering. As a Mission-Focused, Client-Centric and Results-Driven organization, ActioNet also follows the Project Management Institute (PMI) methodology as well as Information Technology Infrastructure Library (ITIL) standards. ActioNet has outstanding financial performance, as evidenced by our “Exceeds Customer Expectations” and the highest 5A1 Financial Rating from Dun & Bradstreet, a 92 out of 100 rating from Open Ratings, the 2014 National Capital Corporate Growth Award by the Association for Corporate Growth (ACG), and Washington Technology Top 100 2012-2017. ActioNet’s human capital leadership is recognized by being designated one of the Best Workplaces for Commuters℠ by the Fairfax County Department of Transportation (FCDOT) 2013-2016 and Washington Post Top Workplaces 2014-2017.